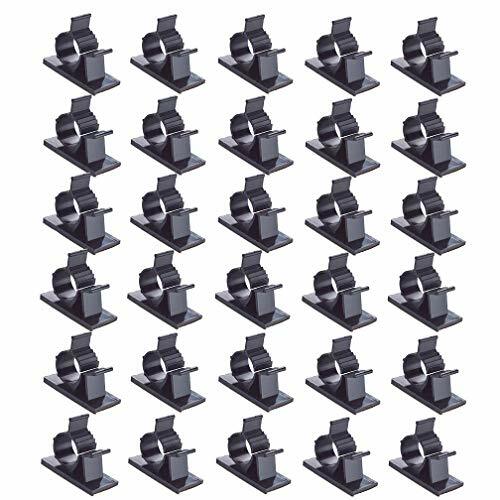 【Adjustable Cable Clamps】Work for cable width(max diameter): 0.4''(10mm).The hook of clips can be adjusted according to the size of the cable.Small in size and space-saving. 【Good Quality Material】Made of 100% industrial strength nylon, acid resistance, high temperature resistance,corrosion resistance, good insulation type, strong load ability, insulation and durable. 【Strong Adhesive】Viaky cable clips have good strength peel and stick self-adhesive pads.No need to punch a hole or attach any screws. 【Wide Use】 The cable clips will work well to help you manage various of cables, such as computer cables, TV cables, Christmas lights cable, USB cable, power cord, etc.Keep your rooms tidy and neat. 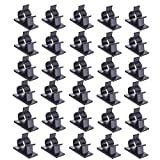 【Package include】Come with 30 pcs black adhesive adjustable cable clamps.